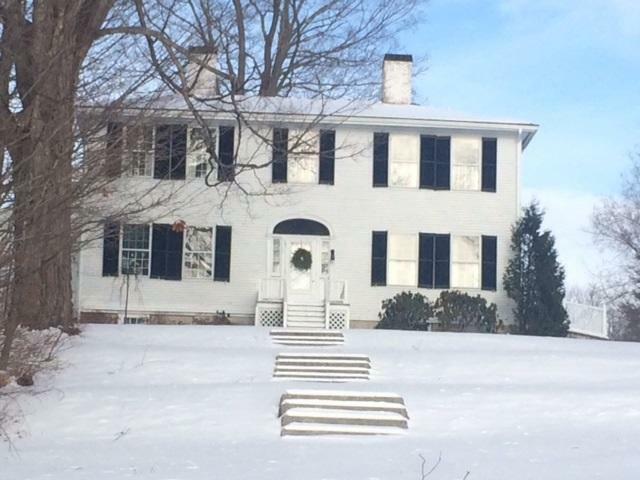 When driving down Windham Center Road toward North Gorham, one can see at the corner of Windham Center and Great Falls roads a gracious Federal period house on a hilltop looking down majestically at the surrounding areas. It is one of three historic homes in what was once was a thriving hamlet nestled across the road from the impressive Great Falls, which are now hidden away from public view. It was a much different scene in earlier times. The first person to harness water power provided by the Great Falls was Zebulon Trickey, who purchased land and mill privileges there in the 1780s. He opened a sawmill and it is believed he built the beautiful house (the Trickey-White House) that can be seen from Windham Center Road. By the 1800s, the river had been bridged and there were now mills on either side of the Presumpscot River that flows parallel to Great Falls Road. It was then that Enoch White built his own large sawmill on the falls. It is thought that about 1820 White also built and resided in the the next house on the right on the road, the Peter Trickey House, another fine example of the Federal style. In 1847, White built and constructed the house at 4 Great Falls Road. Known as the Enoch White House, it is an excellent example of the Greek Revival style of architecture. White was a popular employer and one of the first mill owners in the area to enlist a “gang of saws” in production of lumber. He had a good number of employees and amassed a considerable fortune before going into retirement, ata which time his brother, John White took over. John White bought the business and water privileges to continue operating the mill. A very adept businessman, he was successful land speculator as well. His business prowess eventually made him a very wealthy man. Sawmills were not the only businesses that occupied the small industrial village of Great Falls. In 1842, Portland furniture maker Walter Corey opened a chair factory in the village. Corey was very well known in Portland where he had a warehouse and a showroom. Known as “peoples” chairs at the time, Corey’s furniture was admired for its fine craftsmanship and affordable prices. Because he used manufacturing machines, he was able to keep his prices moderate. Today, these chairs are known as country chairs and are popular with antique collectors. Corey’s chairs were so popular that he doubled the size of his factory. He employed several workers, and in the company’s heyday they churning out 20,000 chairs per year. To house these men, Corey had four tenement buildings in the village. Corey was forced to sell his business due in 1870 to increasingly poor health. Charles Wright of Massachusetts was the buyer, and he ran it successfully until 1872 when the factory, tenements and some other worker buildings were destroyed in a fire. Wright never rebuilt the complex. While Great Falls Village was thriving, it was in good part due to the Cumberland and Oxford Canal that opened in 1830 and carried goods from the village to market in Portland and other towns up and down the river. When the canal closed in 1882, just 10 years after the devastating fire, the village slowly began to fade away. Little remains of the bustling community nowadays, but the three beautiful homes on Great Falls Road serve as a lovely reminder that there was once such a place in our town. Haley Pal, a Windham resident, is an active member of the Windham Historical Society. The Federal-style Trickey-White House can be seen from Windham Center Road. A Walter Corey chair from the collection of Haley and Andrew Pal.